ngland’s ancient capital is a city steeped in history, offering rich pickings for visitors looking to uncover Britain’s past. Begin with the short climb up St Giles’ Hill for an overview of the city’s heritage – from the top you can trace the sweep of medieval and Georgian buildings, laid out according to the original Saxon street plan. From Iron Age forts, to Civil War sites and a world-famous Cathedral, Winchester certainly boasts an impressive array of historical attractions. Winchester is home to a world-famous Cathedral, with the longest medieval nave in Europe, and containing numerous ancient monarchs of Wessex and Winchester. Behind the cathedral, you will find Winchester College – one of the oldest continuously-running schools in the country founded by Bishop William of Wykeham. More details about its historical past and even its modern day involvement in popular films can be found out by taking a tour. Discover a timeless legend and a striking site in one of the finest surviving medieval halls – the legendary King Arthur’s Round Table. And stroll along the water meadows to take part in a 900-year-old tradition when you request the Wayfarer’s Dole upon arrival at the porter’s lodge at The Hospital of St Cross. Or just spend a day learning about Winchester’s role in English history by exploring the galleries at Winchester City Museum. For big bangs and tales of valour head to Winchester’s Military Museums one of the largest collections of military heritage outside London. From the colour and pageantry of great parades to stirring stories of heroism and sacrifice, delve into the rich history of some of the British Army’s most famous regiments and the story of conflict around the world. Visit the collections of regimental history housed within the setting of the historic Peninsula Barracks. The army links to this site date back 2,000 years; in 43AD the Romans built an encampment here, Alfred the Great had his residence here and it was on this site that William the Conqueror laid the foundations for a castle in 1069. From as early as the 18th century there were army barracks on the site. By 1986 the last regimental depots had moved, but the military tradition lives on through the military museums. The Battle of Cheriton took place to the east of Winchester on 29th March 1644, at the height of the Civil War. In a day-long encounter, Royalists fought Parliamentarians for effective control of central southern England. At the end of the battle, Cromwell’s forces were victorious and forced the King’s supporters to retreat northwards. In 2005, a walking trail around the battlefield was established, highlighting the important strategic locations of the encounter. The full walk is 8¾ km long, taking three to three and a half hours, but shorter circular routes can also be created. The Battle of Cheriton Walk leaflet, available from the tourist information centre, details the walking route, which begins at the Hinton Arms pub, providing commentary on the route and an insight into the events that may have taken places on the day of the battle. Throughout history, a wealth of now-legendary historic figures have lived in or made an impact on Winchester. 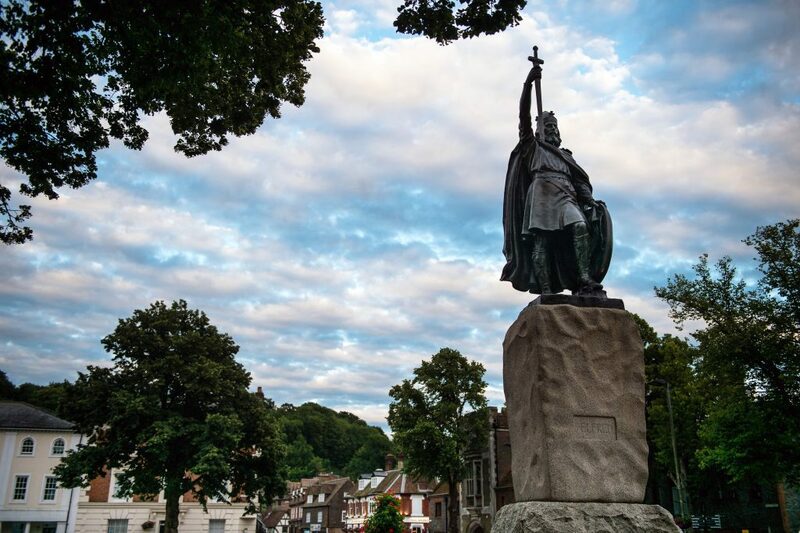 Scholar, soldier, statesman, King Alfred rebuilt Winchester after the Dark Ages and made it his capital. Today his imposing bronze statue dominates the Broadway. His last known resting place has been commemorated with the opening in 2003 of Hyde Abbey Garden, designed by leading landscape architect and former pupil of Winchester College, Kim Wilkie. Bishop of Winchester and reputed tutor to King Alfred. Pilgrims visited his shrine in the cathedral, which was destroyed by Henry VIII’s commissioners. Today he is remembered with a modern memorial in the cathedral. The legend of St Swithun originates in Winchester: according to the story, the saint’s remains were moved, against his dying wishes, from their resting place in a simple tomb in the grounds of the cathedral to a splendid shrine in the inner sanctum, where upon it proceeded to rain for 40 days as a sign of his displeasure. Now, if it rains on the saint’s day (15 July), it is said to herald another 39 days of wet weather. One of the world’s best-loved novelists, Jane Austen lived at Chawton from 1809 and came to Winchester to be nearer her doctor during her last illness. She died in a house in College Street. Her grave and a memorial are in the cathedral. The diver who saved Winchester Cathedral from collapse. For six years (1905-1912), he dived below the east end, replacing rotten timbers and masonry. A statue commemorating his achievements is in the cathedral.